Cushman Motor Company is a Cushman Textron dealership. We sell Cushman’s complete line of gas, diesel or electric utility vehicles, industrial warehouse vehicles, tugs, burden movers, shuttles, and passenger carts. We sell Cushman OEM parts and offer factory trained service. We also rent many of these vehicles. 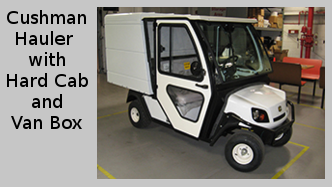 To see specifications on all Cushman vehicles, please visit the Cushman Textron website. Looking for Used Equipment? Click here. Questions? Call us at 612-333-3487 or 800-759-5343. Email us by filling out the form on this page. We demo everything. Click each image to learn more about the equipment you see on this page. These vehicles represent a small fraction of the Cushman commercial grade industrial vehicles, utility vehicles and passenger carts we sell. We sell the Cushman Stockchaser, the Titan and the Minute Miser (above) and all of the other industrial vehicles Cushman makes to move people and heavy loads across the factory floor and warehouse. The narrow widths of the vehicles make them ideal for passing through narrow doorways and between crowded storage shelves. These all electric, battery powered, zero emission warehouse vehicles are used indoors and on paved outdoor areas. 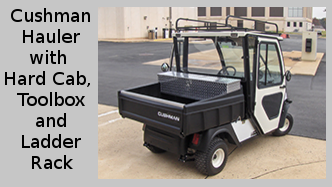 We sell Cushman Textron’s complete line of low-speed electric, gas or diesel powered utility vehicles, shuttles and carts, including the 4X4 Cushman Hauler XD, the Hauler Pro and the Shuttle 2 (above). Nobody knows Cushman product like we do because we’ve been selling the Cushman brand since 1949.